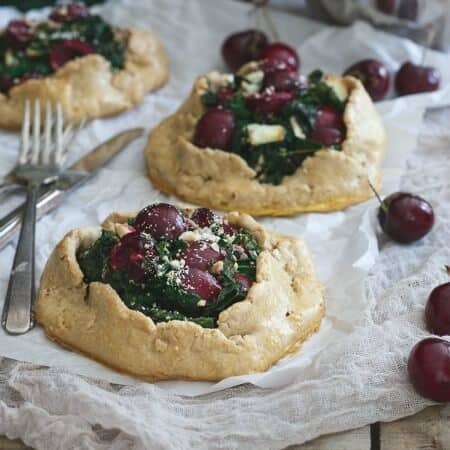 These mini kale and cherry galettes are a sweet and savory bite perfect as a side or even a light vegetarian summer meal. There’s this orchard about 15 minutes from our house that also happens to operate a bakery/farm store. While the orchard itself is just a chaotic madhouse of everyone from NYC getting their fill of the “country” on the weekends (pretty much my worst nightmare), the bakery/farm store which is about 10 minutes away in the opposite direction is a much less frequented, quaint and old red sided building filled with fresh local produce and all the baked goods you could ever want. Of everything in there, there’s only one thing I go in looking for. Nothing beats cherry pie. They’ve got apple, apple crumble, mixed berry, peach, blueberry and pretty much every other fruit pie you can imagine but cherry is where it’s at in my opinion. I haven’t yet bought one this season (yet being the key word here. It will happen. Soon.) 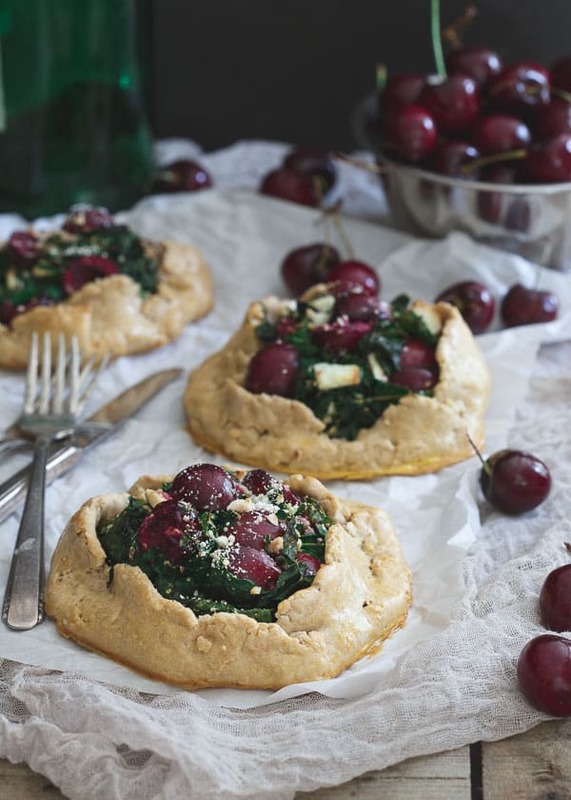 but thinking about it the other day is what inspired these savory sweet kale and cherry galettes. 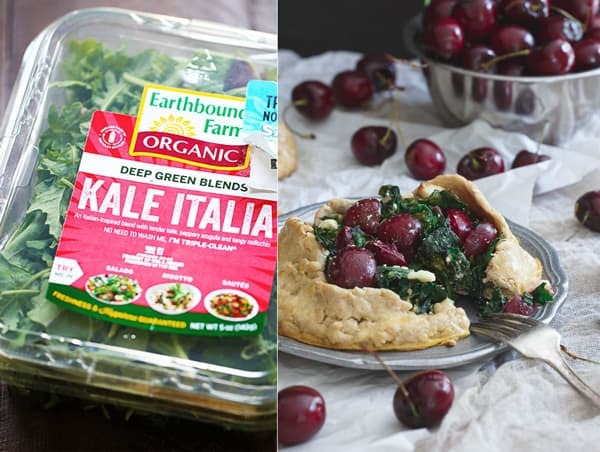 I wanted to pair the cherries with something hearty, green and nutritious and Earthbound Farm’s Kale Italia (a mix of baby kale, mizuna, arugula and radicchio) seemed like the perfect fit. Balancing out the savory and sweetness is a bit of a salty kick from the crumbled feta. All three would be an awesome side dish just sauteed all together but thrown in the middle of a crispy, buttery, flaky pie crust, this galette takes your typical side dish to the next level. It’s the perfect celebration of sweet summer cherries and baby greens and a healthier way to get your cherry pie on! Of course, if you want a full out sweet cherry pie, try these mini tart cherry galettes! Way easier than traditional cherry pie but all the good filling flavor you love. Mix the flours, sugar, salt and baking powder together in a medium bowl. Add the diced butter to the bowl and cut in with a fork or your hand until the mixture is the texture of coarse crumbs. Add the buttermilk to the bowl and bring the mixture together with a fork or your hands. Turn out onto a floured surface and knead into a ball. Wrap in plastic wrap and refrigerate for 45 minutes. Place the olive oil in a large skillet over medium-high heat. Once hot, add the Kale Italia and a cook for 1-2 minutes until just wilted. Remove from heat and let cool. Add the cherries, feta, salt and pepper to the skillet once the dough is ready and mix together. Divide the dough into three sections and roll each section out into a small circle about 1/4 inch thick. You may want to place another piece of parchment paper on top of the dough to help roll it out more easily. Place a heaping amount of the kale and cherry mixture in the middle of the circle leaving a 1/2 inch perimeter empty. Fold the sides up around the filling pinching the dough together as you go and place on the baking sheet. Repeat with remaining two sections of dough and filling. Brush the exterior of each galette with the egg wash then bake for 25 minutes until golden brown around the edges. Let cool 5 minutes before serving. These look so delicious and unique! Love the cherries on them! You always have such fun savory twists on things! Gorgeous galette! The bakery farm store sounds wonderful. I wish we had something like that close by us. This galette looks amazing. 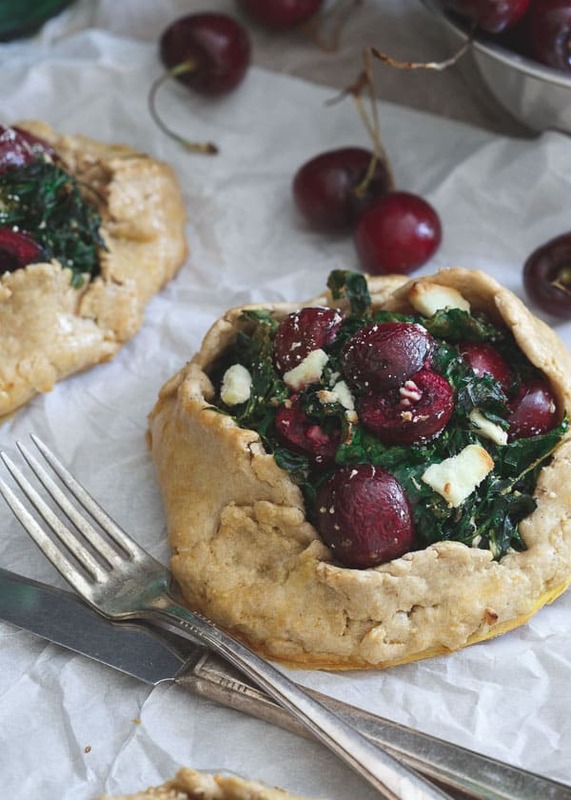 Never would have thought to put kale and cherries together in a baked good. Genius! These are INSANELY beautiful! I LOVE Earthbound Farm, but would have never thought to use the kale in a galette! The salty/sweet/buttery combo here is killing me. In the best kind of way. Pinned! Whoa! You’re not messing around with these. They look phenomenal! We also have an orchard/market within walking distance from our house – I just love it. I don’t know what I like the most about this, the dough, the cherries, no wait it’s the kale! I love Earthbound Farm and I can’t wait to make this! Girl – I love everything about this!!! Such gorgeous photos too my friend! Wow! I would never have thought to pair cherries and kale quite like this. It’s almost like a salad encased in pastry. Super interesting! What gorgeous galettes! The cherries and kale must play off each other beautifully–what a terrific savory dish! I love that you combined kale and cherries!! This is genius. I am intrigued and need to try this! Beautiful photos, as well.